When decay or physical forces cause damage to a tooth, a restoration can repair and stabilize that tooth. Depending on the extent of the damage, a simple filling or crown may be required. However, if the damage is deep, a root canal may be advised as an alternative to extraction. Decay is the primary reason a tooth requires a filling. Tooth decay is caused by the proliferation of acid-forming bacteria. The acid by-product weakens and destroys tooth enamel, which eventually leads to pits forming on teeth. If a pit is caught early in its development, a filling can be placed to reduce the risk for continued decay. A six-month dental checkup is critical: cavities in their early form of development are generally asymptomatic. Once you start to experience pain and sensitivity in a decayed tooth, the cavity has already extended beyond the enamel and will require more extensive intervention. When damage of any kind exposes the tooth pulp, the bacteria that cause tooth decay will invade and infect the root canal, inevitably leading to tissue inflammation and pain in the tooth nerves. The tooth pulp, and surrounding tissue, does not offer the same type of immune response as other areas of the body. Therefore, a root canal is required to remove all the infected tissues to prevent the spreading of the infection to other areas of the mouth and jaw. Dr. Johnson has a high level of expertise with root canal procedures, so you can have peace of mind that you’re in good hands. The first step will be to create an opening in your tooth so that the dentist can remove all of the infected tissues. She will shape the root canal chamber using microtools and then fill it with restorative material to deter further infection or decay and to reinforce the tooth internally. If a significant amount of tooth structure had to be removed, your West Des Moines dentist will place a crown to give the tooth stability and provide further protection from decay. If you would like to schedule a consultation with Dr. Jessica Johnson at Valley Ridge Family Dental, contact our office at (515) 223-9764. 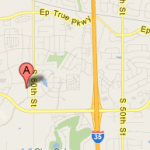 We are located in the Jordan Creek neighborhood of West Des Moines, IA. We also serve Waukee, Urbandale, and Clive.